STAX Racing’s founder, Christian Zoerner, was a long time affiliate of Lee Davidson’s Epic Racing. After getting a behind-the-scenes look on team management, he decided to start up his own team in late 2015. It was not until early 2016 however until the team was publicly unveiled. 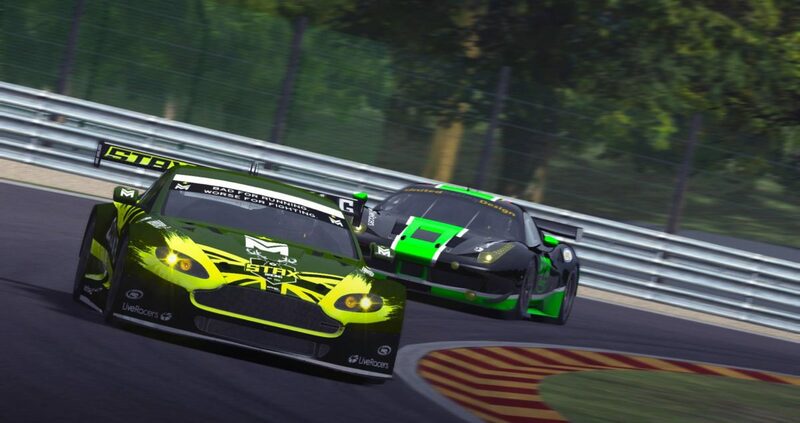 The team decided to start in GPVWC’s 2016 World GT Series and on March, 3rd 2016 it entered its first official race. STAX Racing finished their first season as third in the Constructor’s Championship. Despite not starting in the first two races, Carlos Andres Ladines ended the season in fourth place. In five races, he was able to finish on the podium four times (three times in P3, once in P2). Diego Carranza started five races as well, finishing four of those in the points. In the end, he wrapped up the season in tenth place. Geoffrey Fournier, the team’s substitute driver, was called to action three times. It should be noted that every time his services were required, he finished in a points scoring position. In the final driver’s championship table he was a creditable fourteenth. Andrew Waring started one race for the team, but computer problems forced him to retire in that race. One DNF in his only start means that he was classified forty-ninth out of fifty starters in the end results table. You can read more about our season here. However, that wasn’t the end of STAX’s 2016 activity at the GPVWC, with the news that they were accepted into the 2016 International Touring Cup at their first attempt. Signing up to race with a pair of Honda Civics, ambitions were set high with the signing of Ladines and Carranza once more, fresh off their World GT exploits. To further bolster their line up, Nico Barclay joined in a reserve role, completing an all-Peruvian line up. For the second half of the season, Rob Mason substituted for Carlos Andres Ladines who unfortunately had no more time to attend the races because of his work schedule and Nico Barclay took over Diego Carranza’s seat. Read more about our first Touring Cars season here. In December of 2016, STAX Racing entered RaceDepartment’s MINI Challenge Season 10. The team’s lineup consisted of Andrew Waring and Jazz Forsberg. With 2016 almost complete, STAX Racing have made their presence felt and with a year’s experience, the team is sure to strive to even greater heights in 2017! And indeed, on December 10th, the GPVWC announced that STAX Racing was allocated a place in the 2017 Formula Challenge season. This will the team’s first outing in the league’s prestigious career ladder system.